FHI relies on individuals, churches, donor agencies, foundations, social clubs and organisations worldwide that give in order to reach out the disadvantaged handicapped children in Ghana and other developing countries in Africa. It urges people everywhere to see beyond their own situation and interests to care about the education, training and needs of these vulnerable disabled people. US$10 can pay for a fresh child’s chalk, crayon and exercise books per term. US$30 can buy 2 set of school uniform for a fresh child per term. US$100 can pay for 4 fresh children’s school shoes and bathroom slippers. US$1000 can pay for 3 fresh children’s complete school kits (containing all that is needed for a fresh child's boarding requirements). Under this Special Childcare Programme, sponsors can adopt as many children as they like. Request could be made through FHI office whereby the office will send CSP forms with pictures of needy disabled children to the individual or joint church/organisation sponsors to make their choices. Commitment is then made by the sponsor(s) to send regular donations to support their foreign needy children or child. On top of their commitments to the programme, sponsors may make specific gifts in cash or kind to their sponsored child or children. The money donated to the sponsored child/children is pooled together to provide educational facilities, health and general development for all FHI children throughout the country. FHI will send periodic news, information and updates to all sponsors concerning their sponsored children. FHI accepts donations like clothing, footwear, pharmaceuticals, computers, hospital supplies,and educational materials such as assorted text/exercise books, special equipment for the disabled such as: hearing aids, assessment machines, text transmitter for the deaf (text mobile phones); Braille (Perkins), hand frame, style (pen), cubarithm board/cubes, Brailon sheets A4, braille sheets A4, pocket frame, white cane; clutches and wheel chairs; carpentry tools, shoe/sandals making machines, school buses. 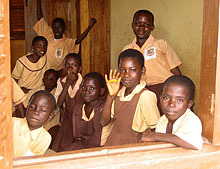 Companies, individuals, churches, organisations and philanthropists worldwide can send items through FHI Support Offices in UK and Sweden for distribution to People with Disabilities (PWDs) - especially children in the beneficiary schools and communities as well as health and educational institutions in Ghana. - a Polytechnic/University for the Deaf.